West Virginia Attorney General Patrick Morrisey questioned the ability of Democrat Sen. Joe Manchin to present himself as a moderate given his Senate leadership position under Sen. Chuck Schumer (D., N.Y.), arguing that Manchin should resign from the post if he shares the values of West Virginians. Morrisey, a Republican, is running to unseat Sen. Manchin in West Virginia, a state that overwhelmingly voted for President Donald Trump and remains in his corner. Recent Gallup polling found a 60 percent approval rating for Trump in West Virginia, making the state Trump's strongest bastion of support. Morrisey says that West Virginians have made it clear they don't support the policies being pushed by Democrats such as Manchin, who is vice chairman of the Senate Democratic policy committee. "Being part of the Schumer leadership team means that you don't have West Virginia's best interest in mind," Morrisey told the Washington Free Beacon. "West Virginians don't support the values of Chuck Schumer—Joe Manchin does." Manchin, who presents himself to voters as a moderate running on the Democratic ticket, is considered to be one of the most vulnerable incumbents running for reelection in 2018. Morrisey believes Manchin's position on issues such as gun control put him in "deep trouble." "I have no doubt that Senator Manchin enjoys a boost because people are not aware of his very liberal record," Morrisey said. 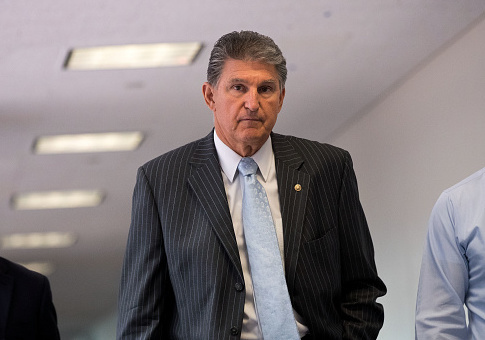 "On the issues that matter most to West Virginia, Manchin has failed the state." One of those issues is gun control. Morrisey, who won the endorsement of major gun-rights groups shortly after announcing his candidacy, said Manchin is "clueless" regarding the Second Amendment. "That is someone who is clueless on how the Constitution works and how the Second Amendment operates," Morrisey said of Manchin, citing the senator's comment last year that "due process" was to blame for gun violence. Manchin positioned himself during his first Senate run in 2010 as an NRA-endorsed candidate who would "take on Washington," but just a few years later he ended up running ads against the national gun-rights group. Manchin began turning down interviews unless reporters agreed that he wouldn't be asked about guns. Morrisey argues that Manchin's views began to change once he became a "career politician" and left West Virginia, where over 50 percent of individuals in the state own a firearm. "I think Joe Manchin lost his way as he has traveled to Washington and became a career politician," Morrisey said. "He lost respect for the Second Amendment." Shortly after Manchin ran ads criticizing the NRA, he was hosted at the New York City home of Michael Bloomberg, who spends millions of dollars attacking the NRA. Morrisey says Manchin has been "touting the Bloomberg pro-gun control line." Manchin also just received nearly $100,000 from a law firm that has offered free legal services to groups pursuing gun control. Meanwhile, Morrisey says he has been fighting to protect gun rights as West Virginia's attorney general. On Monday, Morrisey led a five-state coalition insisting the U.S. Supreme Court review a federal appeals court decision that the potential presence of a weapon automatically makes an individual dangerous. "You can't deem someone dangerous because they are armed," Morrisey said of the court brief. "You shouldn't have to sacrifice one of your constitutional protections to enjoy another." Morrisey has worked to align himself with Republican President Donald Trump, who has also been praised at times by Manchin. Morrisey, however, said that Manchin's praise of Trump is due to "political convenience" and predicted that voters wouldn't buy it. "This is just a matter of political convenience," Morrisey said. "West Virginias are going to see through it." Morrisey said he is "looking forward to debating" with Manchin, but he will need to emerge from a crowded Republican primary that includes Rep. Evan Jenkins before he gets the chance to do so. This entry was posted in Politics and tagged 2nd Amendment, Joe Manchin, Patrick Morrisey, West Virginia. Bookmark the permalink.